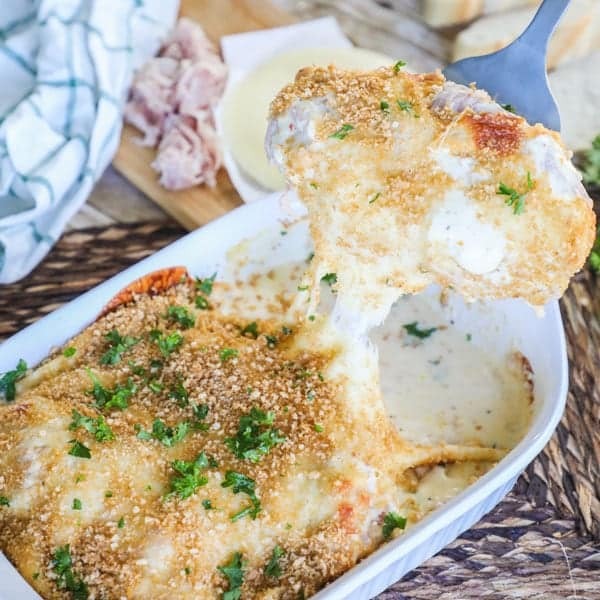 This easy chicken cordon bleu casserole is the easiest and tastiest way to make the flavors of Chicken Cordon Bleu on a busy weeknight. With only a few simple ingredients you can have this prepped and in the oven in as little as 15 minutes. 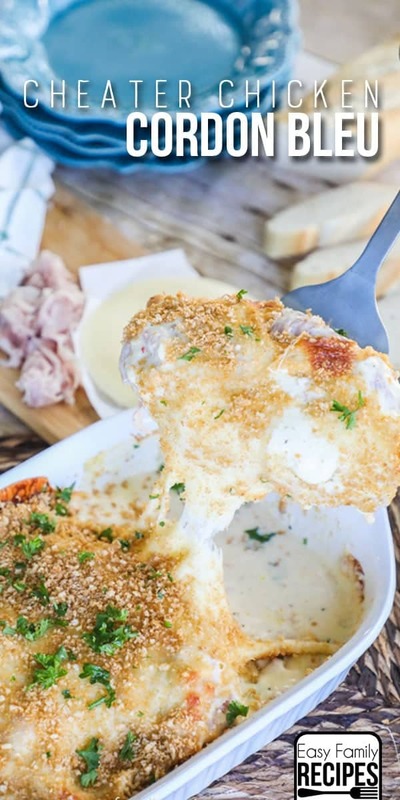 Tender chicken breast is layered with ham and a flavorful sauce, then topped with cheese and a crispy bread crumb topping for a subtle crunch. For as easy as this is to make, you won’t believe how delicious it is! The first week of school was all nice and organized with meals planned, lunches made, the house clean, etc. The second week was another story. I kinda forgot we had to keep doing this all year long, not just the first week. But really, I don’t know about you, but I had to whip myself back into shape and get back on the bandwagon with making dinner this week. So this Chicken Cordon Bleu Casserole recipe was born part out of inspiration and part out of necessity. 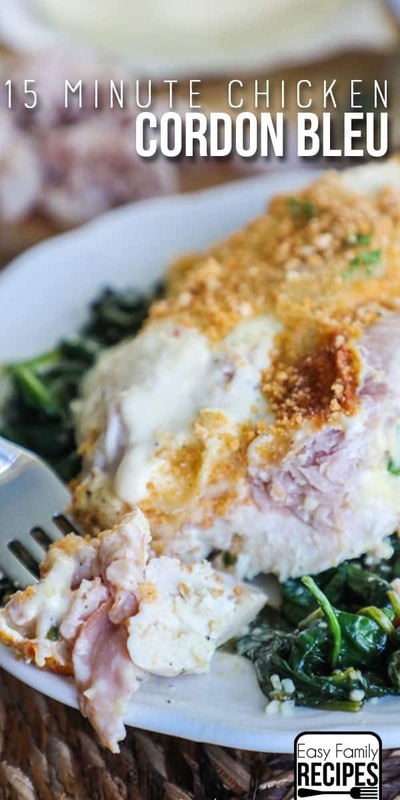 The great thing about this dinner is that it has the grown up flavors we know from chicken cordon bleu, all combined in one ridiculously easy to make, and super creamy and kid friendly casserole. Since it is made in one dish, not only do you get it in the oven fast, but you also have almost no clean up at the end. 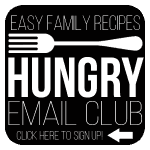 Before we get too far in the recipe, I would love to mention two things… First, I want to invite you to join me in my Hungry Email Club. If you need lots of easy dinner inspiration, like this recipe, sign up for my weekly email and get new ideas to your inbox each week. Click here to sign up or on the button below. Second, if you need a list of ideas pronto, I have a whole list of easy chicken recipes to get you going fast here! Consider that your jump start! What’s in Chicken Cordon Bleu? This casserole is inspired by Chicken Cordon Bleu, but it is not a strictly classic recipe. I modified it to be something really family friendly and really quick and easy to make, so even though it isn’t the most traditional recipe, it is absolutely delicious and has been a huge hit with both our family and our guests. I will tell you in the recipe where you can substitute ingredients to make a more traditional chicken cordon bleu casserole. Rice– Serve on a bed of your favorite rice. I used long grain wild rice the last time I made it! 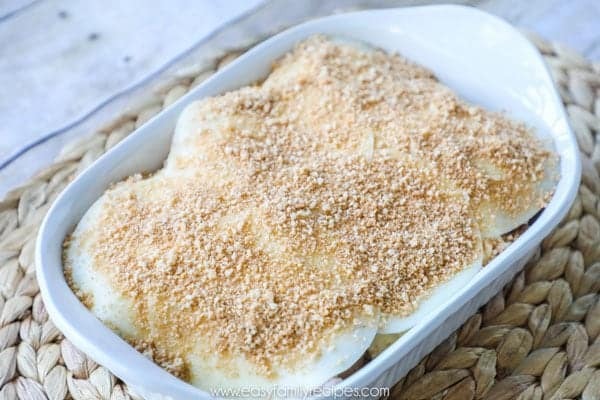 Potatoes– You can serve the chicken cordon bleu casserole right on a bed of mashed potatoes which is really yummy with the sauce, or with a side of red potatoes. Pasta– Serve with a side of pasta or right on top of your favorite kind. Garlic bread– Serve with a big piece of crusty garlic bread. It is perfect for soaking up all of that flavorful sauce! Greens– Serve it right on top of a big bed of sautéed spinach. That is one of my favorites. 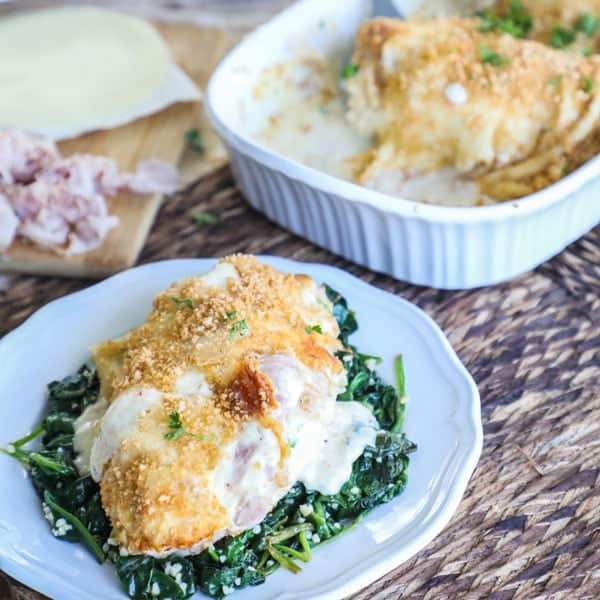 You can also serve the chicken cordon bleu casserole on other greens like kale or collard greens. Green veggies– Because of the rich flavor in this dish, it goes really well with green veggies like green beans, asparagus, or brussel sprouts. Salad– This dish makes the perfect compliment to a nice green side salad. Cauliflower– Serve the chicken cordon bleu casserole on a bed of cauliflower rice or with a side of roasted cauliflower. See how to make cauliflower rice here. 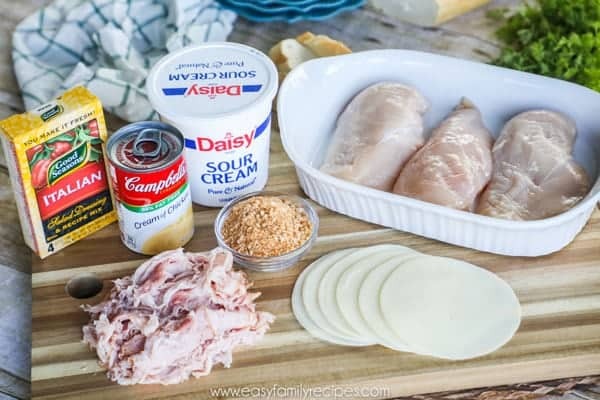 Follow along here where I will talk all about how to make this chicken cordon bleu casserole in detail with all of my note, tips and tricks for the recipe. If you are just looking for a quick version, scroll to the bottom for the recipe card. 3 boneless, skinless, chicken breasts– This will be about 1.5 pounds. If your chicken breasts are small you might can use 4. If your chicken breasts are extra large, you might want to butterfly them before putting them in the casserole dish so that they cook more quickly. 1/4 lb shaved ham- If you have a favorite brand, you can use it! I am pretty picky about my meats so I used Boar’s Head Black Forest Ham. Make sure to use a ham that has great flavor so that it keeps the dish super flavorful. 2 cans cream of chicken soup- I used Campbell’s 98% fat free cream of chicken soup. You can also use the regular version. 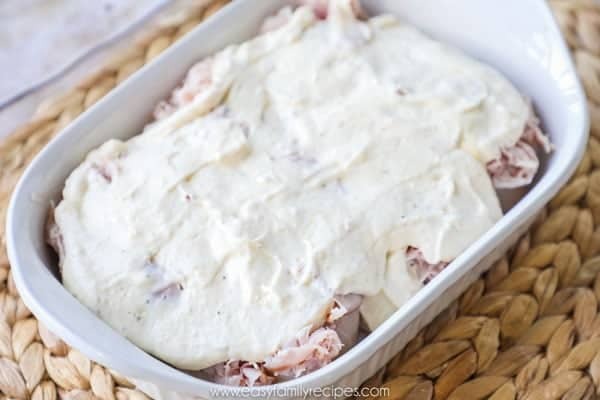 1 package Italian dressing mix- This isn’t the most traditional way to make chicken cordon bleu sauce, but it makes the dish incredibly delicious without much effort so it is a huge win for me! 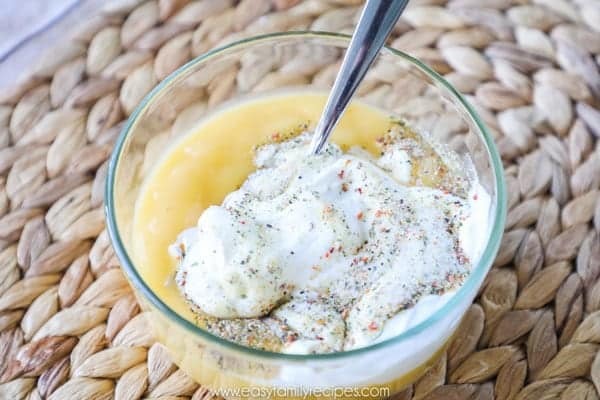 1 cup sour cream- You can use regular or light sour cream. 6 slices provolone cheese- Classic Chicken Cordon Bleu recipes always use swiss cheese. If you like swiss cheese, feel free to substitute it here. 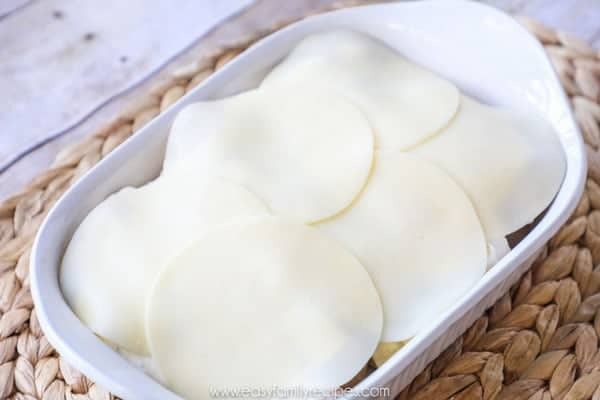 My kids don’t really like swiss cheese, so to make it a bit more kid friendly I went with provolone in my recipe which is mild and compliments the flavors well. 1/2 cup panko bread crumbs- Make sure to buy unseasoned since we have so much flavor going in to the dish itself. You don’t want to over power it with the topping. In a medium bowl, mix the cream of chicken soup, sour cream, italian dressing mix, and dijon mustard until combined. This makes a really flavorful sauce. If you want a milder sauce you can try using 1/2 of the packet of Italian seasoning. Lay the chicken breasts flat in the bottom of a large casserole dish and season with salt and pepper. Divide the ham equally to the number of chicken breasts you have and lay it on top of each one. Then spread the soup mixture over the top of the entire casserole dish. If you want to freeze this dinner to make at another time you can freeze it at this step. Store it air tight in the freezer, and when you are ready to bake, thaw the dish and then continue on to step 4 topping it with cheese and bread crumbs and baking. Lay the provolone cheese out evenly on top of the soup mixture. Last, top the entire thing with the panko bread crumbs. If you want a more traditional chicken cordon bleu flavor feel free to use swiss cheese here instead of provolone. This step really makes the magic happen. It cuts out the time of coating each chicken breast in bread crumbs by adding them to the top of the casserole. You still get the texture and crunch as the oils in the cheese keep the bread crumbs nice and crispy, but it saves a ton of time over doing it individually. Bake on the middle rack of the oven for 40-50 minutes or until the chicken is cooked through to an internal temperature of 165˚F. You shouldn’t need to cover this dish if it is cooked on the middle rack, however, each oven cooks differently based on brand, size, climate, altitude etc., so I recommend starting uncovered and checking it in the last 1/3 of the cook time. If it is getting too browned for your tastes, then loosely cover it with foil for the remainder of the cooking time. Serve hot with any of the suggested options above and enjoy! I genuinely hope that you enjoy this recipe as much as our family does. If you get a chance to make it, I would love for you to leave me a note in the comments. It makes my day to see that others are using my recipes to help get dinner on the table for their families. Or even better, snap a pic and tag me on Instagram @easyfamilyrecipes. It is so fun to see your creations! Don’t forget… to get more easy recipes like this each week, sign up for my Hungry Email Club! I’d love to have you join me! This family friendly Chicken Cordon Bleu Casserole has everything you love about chicken cordon blue in a much quicker and easier dinner recipe. You can have this from fridge to oven in as little as 15 minutes and it is still packed with flavor! In a medium bowl, mix the cream of chicken soup, sour cream, italian dressing mix, and dijon mustard until combined. Lay the chicken breasts flat in the bottom of a large casserole dish. Divide the ham equally to the number of chicken breasts you have and lay it on top of each one. Then spread the soup mixture over the top of the entire casserole dish. To freeze this to make another night, prepare the dish through step 3 and then freeze. When you are ready to cook, dethaw the dish and pick up on step 4 topping with cheese and bread crumbs and bake. Nutrition info is calculated based on my best estimation and may not be accurate. I suggest using a nutrition calculator to calculate the data based on the exact brands, ingredients and modifications you use on the recipe for the most accurate information. I made this exactly as piblished and it was great. I served it over sauteed spinach. Really easy and really good and creamy.